Endoscopic ultrasound-guided hepaticogastrostomy (EUS-HGS) has emerged as an alternative technique to endoscopic retrograde cholangiopancreatography (ERCP)  . During EUS-HGS, the process of fistula dilation is technically challenging. To date, various dilation devices and techniques have been reported   . However, despite improvements in dilation devices, challenging cases are still sometimes encountered. We herein describe a pitfall of EUS-HGS, which may be one of the reasons for the challenges encountered in some cases. The presented case was a 78-year-old woman with advanced cholangiocarcinoma causing duodenal and biliary obstruction. 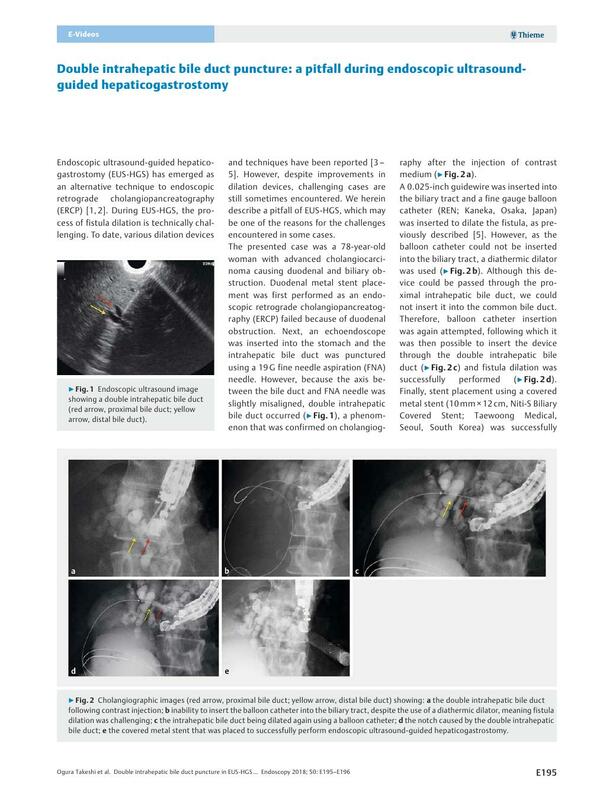 Duodenal metal stent placement was first performed as an endoscopic retrograde cholangiopancreatography (ERCP) failed because of duodenal obstruction. Next, an echoendoscope was inserted into the stomach and the intrahepatic bile duct was punctured using a 19 G fine needle aspiration (FNA) needle. However, because the axis between the bile duct and FNA needle was slightly misaligned, double intrahepatic bile duct occurred ([Fig. 1]), a phenomenon that was confirmed on cholangiography after the injection of contrast medium ([Fig. 2 a]). Fig. 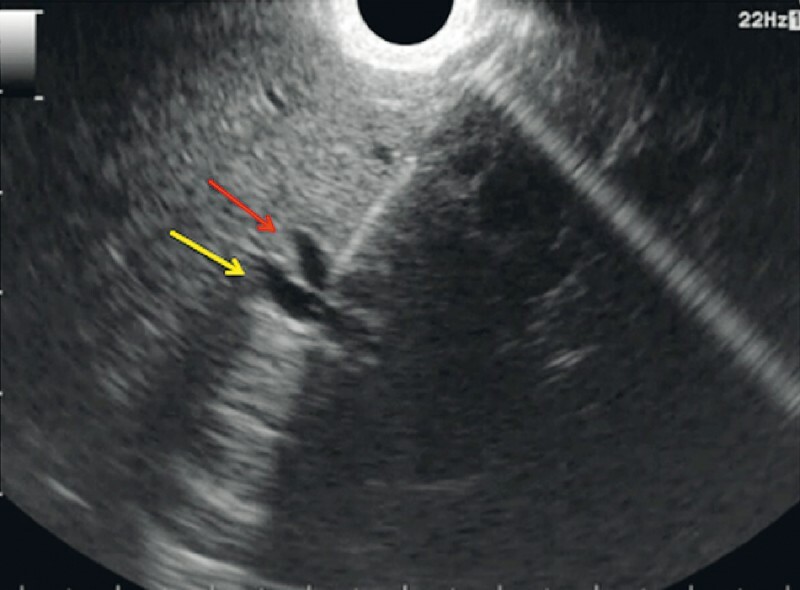 1 Endoscopic ultrasound image showing a double intrahepatic bile duct (red arrow, proximal bile duct; yellow arrow, distal bile duct). Fig. 2 Cholangiographic images (red arrow, proximal bile duct; yellow arrow, distal bile duct) showing: a the double intrahepatic bile duct following contrast injection; b inability to insert the balloon catheter into the biliary tract, despite the use of a diathermic dilator, meaning fistula dilation was challenging; c the intrahepatic bile duct being dilated again using a balloon catheter; d the notch caused by the double intrahepatic bile duct; e the covered metal stent that was placed to successfully perform endoscopic ultrasound-guided hepaticogastrostomy. A 0.025-inch guidewire was inserted into the biliary tract and a fine gauge balloon catheter (REN; Kaneka, Osaka, Japan) was inserted to dilate the fistula, as previously described . However, as the balloon catheter could not be inserted into the biliary tract, a diathermic dilator was used ([Fig. 2 b]). Although this device could be passed through the proximal intrahepatic bile duct, we could not insert it into the common bile duct. Therefore, balloon catheter insertion was again attempted, following which it was then possible to insert the device through the double intrahepatic bile duct ([Fig. 2 c]) and fistula dilation was successfully performed ([Fig. 2 d]). Finally, stent placement using a covered metal stent (10 mm × 12 cm, Niti-S Biliary Covered Stent; Taewoong Medical, Seoul, South Korea) was successfully performed ([Fig. 2 e]; [Video 1]). Unfortunately, because of the prolonged procedure time (58 minutes), biliary peritonitis occurred, which subsequently required 7 days of conservative treatment. Video 1 The intrahepatic bile duct was punctured using a 19 G fine needle aspiration (FNA) needle; however, because the axis between the bile duct and the FNA needle was slightly misaligned, double intrahepatic bile duct occurred. After contrast medium had been injected, the guidewire was inserted into the biliary tract. Although a fine gauge balloon catheter was used, it was not possible to insert the device into the biliary tract. Fistula dilation using a diathermic dilator was therefore attempted; however, although this device could be passed through the proximal intrahepatic bile duct, it could not be inserted into the common bile duct. Balloon catheter insertion was then attempted again and this time it was possible to insert the device through the double intrahepatic bile duct, allowing EUS-HGS finally to be successfully performed. Our experience suggests that if a double intrahepatic bile duct is encountered during EUS-HGS, re-puncture for the second bile duct may be considered.